Pantry, originally uploaded by Lobstersquad. in response to Sang, here's a bit of my pantry. I have so many things it's ridiculous, but I really do use most of the ingredients, although some impulse buys tend to linger. Melon seeds from an African spice shop? Really? One thing I stongly recommend is putting everything possible in glass jars. Any empty jam, mayo, peanut butter or honey jar will do. 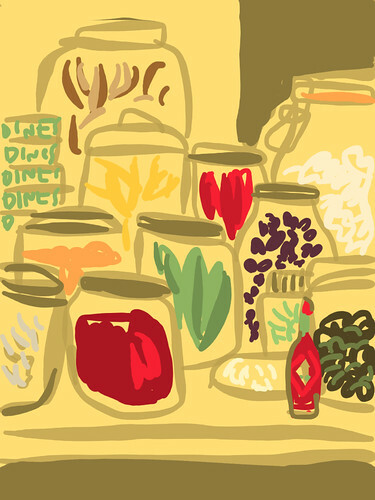 it feels so much better to take your raisins or pine nuts or pimentón out of a glass jar than out of a crinkly packet that spills everything it has failed to keep fresh. Posted by lobstersquad at 6:21 p. m.
Thank you! Lovely drawing, a lot nicer than a photo. I'll keep your tip in mind. Do you order your spices from a food shop online? Or is there any online shopping store you prefer? It's good to store various items in containers. I have a select set of decorative jars that I use. sang: glad yo like it! bof:not really, I just buy from big supermarkets or from asian shops around town. I make do with empty jam jars, but sometimes I make pretty labels.